​You can never have enough effect pedals. Just ask any guitarist worth their sonic salt! Since there are literally thousands of stomp boxes on the market, maybe this is hardly surprising — all the more so since they each offer something different in terms of sound, purpose, or quality. Quantifying this time-honoured trend in today’s DAW-driven workflow with its all-new MultiDrive Pedal Pro plug-in bundle sits naturally with the future-facing nature of Audified. As such, it is professionally primed to provide the perfect bundled blend of overdrive (for power), distortion (for complexity), fuzz (for fuzziness), and boost (for allowing every detail to shine through). The talented team of Audified engineers expertly draw upon the company’s rich history of creating quality guitar software to simulate 12 legendary effect pedals that every musician should have in their studio setup. Since this effectively represents the company’s third generation of stomp box models — made with totally new modelling technology — they simply sound perfect! 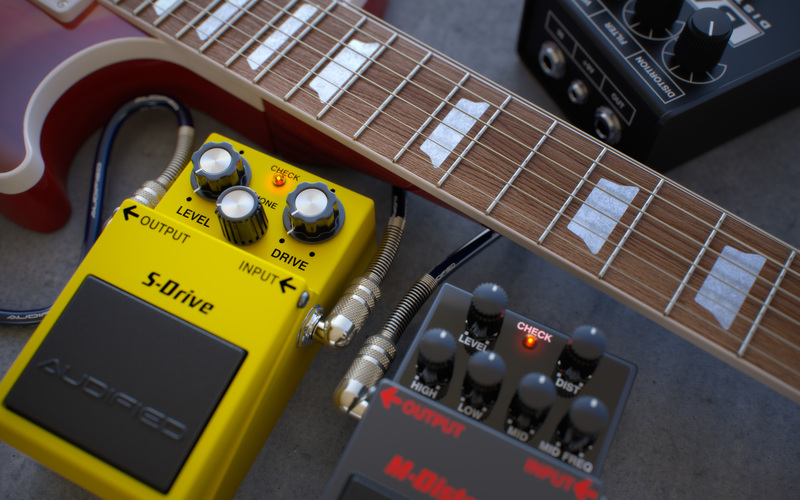 ​Put it this way: with MultiDrive Pedal Pro, Audified removed every last screw from every effect pedal modelled, meticulously measuring all components within, so users cannot tell the difference between the real-world stomp boxes and the following software simulations so readily accessible in the resultant bundle. ​808-Scream is based on the TS-808 Tube Screamer, a guitar overdrive pedal made famous by Ibanez. It was originally released in the late Seventies, and its characteristic mid-boosted tone soon proved popular with blues and rock guitarists. It has since been used by countless guitarists to create their signature sound, remaining one of the most successful, widely copied, and ‘modded’ overdrive pedals in the history of the electric guitar! ​BAT-Distortion is based on Pro Co Sound’s RAT Distortion. ‘The Rat’ became very popular in the early Eighties, thanks, in part, to being used by several famous artists. As a primary distortion device, it excels at arena rock rhythm tones and soaring leads, but its true beauty lies in its versatility. ​F-Fuzz is based on Jim Dunlop’s Fuzz Face, an effect pedal mainly used by electric guitarists and also some bass players. Designed to produce a distorted sound from an electric guitar, a sound often referred to as ‘fuzz’ — which was sometimes achieved by accident earlier through broken electrical components or damaged speakers, this particular Fuzz Face distortion is constructed to vintage specs, featuring the original Germanium PNP transistor design for a rich, creamy fuzz sound.